They are back! And this time they will be dimension-travelling to bring the weirdest and most interesting objects from all over the entire universe. In return, they want fish, petting and a nice warm scrub. Yes they are special cats and you can collect them all in Kleptocats 2. When you tap a kitty, a wormhole appears above him and he jumps into it. This special ability makes him travel from one room to another and also traverse galaxies in an instant to bring unusual items of interest. You can ring the bell to bring him back or wait for some time before he finds (read: steals) an object and comes back home. Many times, your pet cats won’t be a in a mood to travel. You will have to pet or feed them to cheer them up and soon they will get back to business. Soon after the tutorial ends, you will be a proud owner of two cute felines – Guapo and a mysterious ghost cat. You can send both cats to explore the galaxy. They will bring interesting items and rare artifacts. However, keep in mind that you will have to spend 100 coins to teleport the second cat after sending the first cat. In my opinion, you shouldn’t waste those precious 100 coins just to send another cat. Instead you can play a mini game or two to get some extra coins while your cat explores every nook and corner of the world in search of fascinating items. As soon as your first cat gets back home, send your second cat. I can understand that sending both cats at once will save time, but you should save coins instead of time. It’s said that a penny saved is a penny earned. Instead of spending coins to send your cat, save coins so that you can use them to skip time and quickly bring your kitty back home. Sometimes, your kitty will bring lots of coins so the amount spent to bring your cat back faster really pays off. So your kitty brought a strange looking artifact and you can’t wait to show it off to your friends? Go on; tap that purple button to share the pic of that object via email, hangouts or social networking sites. When you share pics of objects, you get bonus coins. But wait, there’s a trick to get bonus coins without actually “sharing” anything. Just tap the share button. When the list of sites appears, quickly tap the cancel button. You will still get some coins. 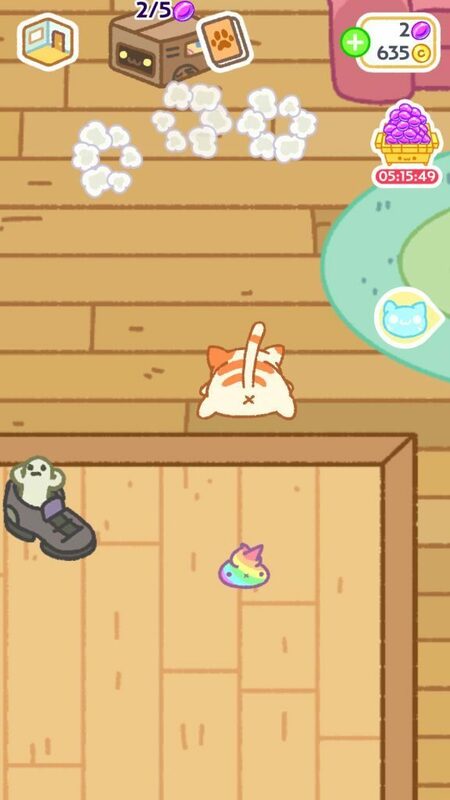 You can try this quick cheat if you are playing Kleptocats 2 without an Internet connection. Now that your kitty has gone out to explore the world, it’s time to kill time. You can close the app and come back later or play some mini-games. There’s one big advantage of playing a mini game – you will earn coins while waiting for your darling kitty to come home. There are three mini games and a fourth one will be launched soon, probably in the next update. Of these three games, two are very easy to play and the best part is that you can earn lots of coins by playing them. These two games are “Catchy Cat” and “Sneik”. Catchy Cat is one addicting game that lets you move your cat back and forth to catch falling fish. You must catch 6 fish to get a coin. Coins may also fall down so make sure you grab them. Sneik is very easy to play and is inspired by the popular “snake” game. You just have to swipe up, down, left or right so that your kitty moves towards pieces of delicious meat and eats them. To get a coin, you must collect 7 pieces. Apart from meat, you will also come across coins, so don’t forget to move your cat towards a coin to collect it. I have noticed that I got lots of coins in a very short period of time by playing these two games. Try them and let me know. They are bright, colorful, they stink, but they hide coins underneath them. Yes I am talking about kitty poo. You will find them scattered all over the lobby, patio and the shed. When you see one, quickly tap it to get 2 coins. 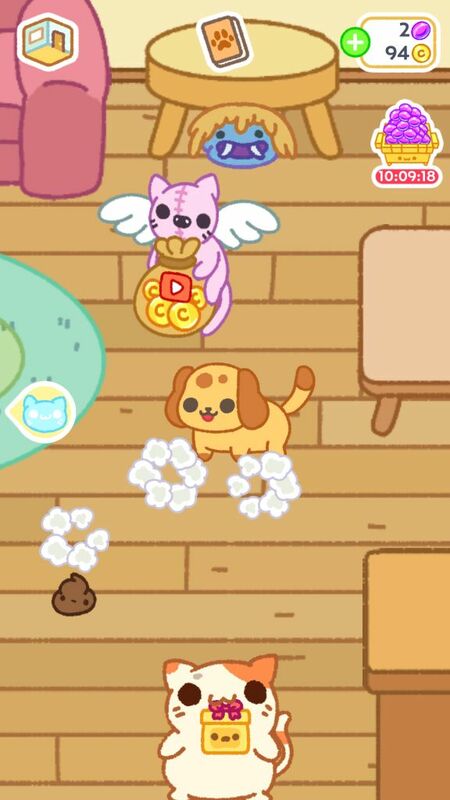 Poos come in different colors – brown, pink, even rainbow-colored poop, but their color does not matter as you will get a fixed number of coins when you tap them. Cleaning cat doo-doo was never this fun! These special kitties probably appear once or twice a day and give away plenty of coins when you tap them. Angel kitty hovers around, stays for a few seconds and then flies away. Quickly tap her to watch a short video and get coins. When the flaming or nirvana cat appears, keep tapping him until he vanishes away. Every time you tap him, you will get coins. Your cat will bring pieces of a big jigsaw puzzle every now and then. To see the puzzle, just tap a cat and then tap a jigsaw piece shown beside his/her name. You will be able to see the puzzle and the unlocked pieces under “Cat Info”. Collect pieces and complete the puzzle to get rewards. Each kitty has his own puzzle and the pieces he brings back will fit that puzzle. By the way, in the first game, you would get a bonus cat after completing a jigsaw puzzle. There’s more than one code hidden in each room. You will have to find one, note it down somewhere or memorize it (or just read the above screenshot), tap Album > Safe and enter the code into the box. Next tap “Confirm”. You will get a gem on successfully cracking a safe. Do this for each room to get gems. Check this thread for more codes. The cute little “GemDog” gives a free gem every day. On some days, you will get more gems. Just make sure you open the app every day to get your rewards. On day 2 you will receive 2 gems, whereas on day 7 you will get 3 gems. Completing jigsaw puzzles is another way to get new cats. You can also get purple stones by opening safes. Exchange coins for gems from the dog. After receiving your free gem, tap the dog again and he will offer you another gem for 450 coins. You should hoard coins only for: Bringing back cats and exchanging them for those precious purple stones. 9. Inside Your Album – What’s New? When you tap your album, you will notice several familiar options and a few new surprises, such “boutique”. Cat-alog: It features a list of cats you have unlocked so far. Tap it and then tap a kitty to know more about him. It will also show a list of jigsaw pieces you have collected. You can also take a screenshot of your kitty by tapping the camera icon and change his name. Inventory: If you want to know what that creepy artifact is called, just head straight to your inventory and tap it. 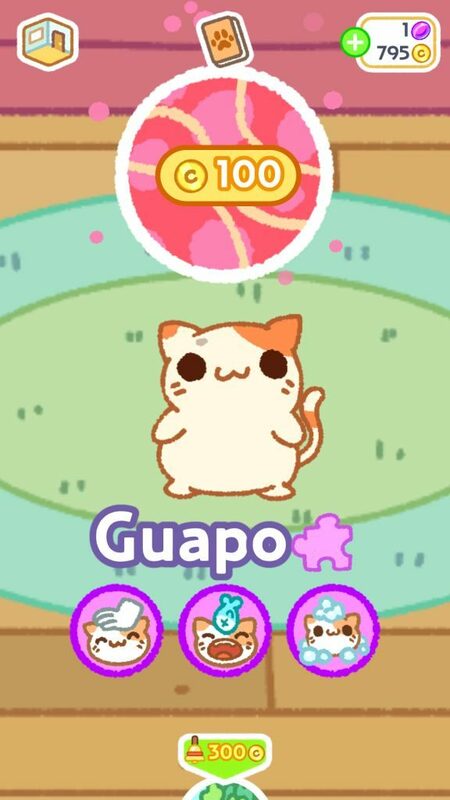 New Cat: Tap it to exchange purple stones for a brand new, adorable cat. Boutique: Might possibly be a place to purchase accessories and cool costumes for your cats. Shop: This is where you can purchase gems and coins. You can also exchange 1 gem for 300 coins, but I wouldn’t advise you do this. Those purple stones are precious and you will require more and more gems as you keep unboxing kitties. Screenshot: Tap this option to take a screenshot of a room. You can then share the pic with your friends via Gmail, hangouts and Bluetooth or messenger. Safe: This is where you will enter secret codes. Tapping the social networking icons below a safe will take you to the official Twitter account/Facebook page of developer Hyperbeard games. You can get code hints for their social media accounts. Settings: Allows you to change language and adjust volume. You can also turn off poop and cat icons that appear on a room via settings. Rooms: Lets you change rooms. Also shows the number of cats unlocked, how many more gems you can earn from cracking safe in each room and the total number of inventory collected so far. I tried the codes in the screenshot but only two worked.